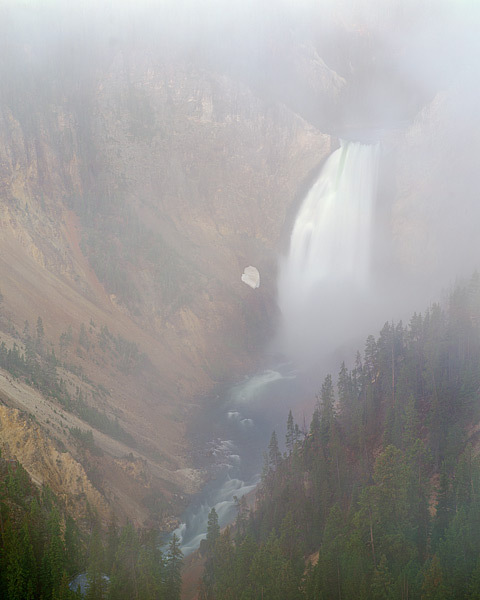 Early morning finds the Grand Canyon of the Yellowstone and the Lower Falls shrouded in fog and mist. Slowly as the Sun rises in the sky the fog begins to lift and reveal this awesome sight. When I first arrived at the sight this morning, the Lower Falls could only be heard crashing over the drop, but because of the very thick fog, one could not be see the actual falls for sometime. It was an impressive sight watching this Wyoming landmark slowly reveal itself as the fog and mist lifted over Yellowstone National Park. Photo © copyright by Thomas Mangan.